The Popular Culture collection contains websites that middle school students use for fun. 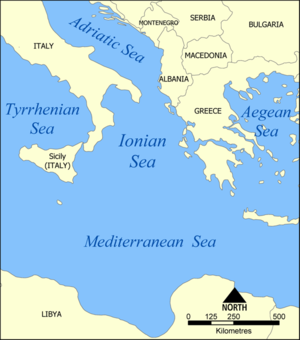 The Ionian Sea is an arm of the Mediterranean Sea, south of the Adriatic Sea. It is bounded by southern Italy including Calabria, Sicily and the Salento peninsula to the west, southern Albania to the north, and a large number of Greek islands, including Corfu, Zante, Kephalonia, Ithaka, and Lefkas to the east. The islands are collectively referred to as the Ionian Islands, and other islands include the Strophades, Sphagia, Schiza, Sapientza and Kythira. The sea is one of the most seismic areas in the world. There are ferry routes between Patras and Igoumenitsa, Greece, and Brindisi and Ancona, Italy, that cross the east and north of the Ionian Sea, and from Piraeus westward. 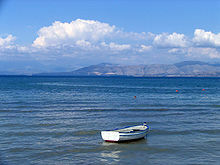 Calypso Deep, the deepest point in the Mediterranean at −5,267 m (−17,280.2 ft), is located in the Ionian Sea, at 36°34′N 21°8′E﻿ / ﻿36.567°N 21.133°E﻿ / 36.567; 21.133. ^ Barale, Vittorio (2008). "The European Marginal and Enclosed Seas: An Overview". In Vittorio Barale and Martin Gade (eds). Remote Sensing of the European Seas. Springer Science+Business Media. pp. 3–22. LCCN 2007-942178. ISBN 978-1402067716. http://books.google.com/books?id=9B3D5-HBTzkC&pg=PA14&dq=%22Calypso+Deep%22#v=onepage&q=%22Calypso%20Deep%22&f=false. Retrieved 28 August 2009. ^ "Limits of Oceans and Seas, 3rd edition". International Hydrographic Organization. 1953. http://www.iho-ohi.net/iho_pubs/standard/S-23/S23_1953.pdf. Retrieved 7 February 2010. This page was last modified on 25 February 2011 at 05:41.